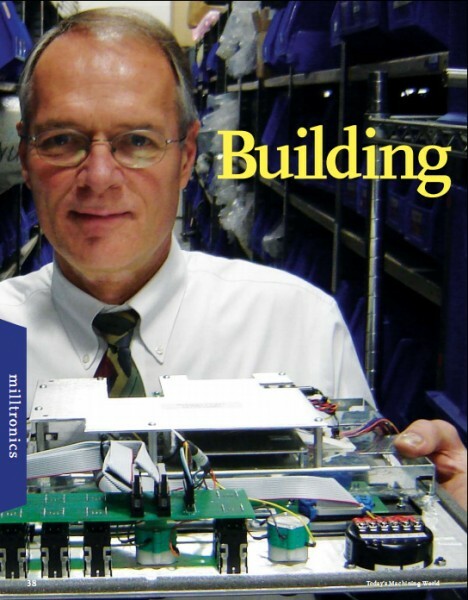 LG: Tim, Milltronics is a machine tool company you built from nothing over 30 years. You recently sold it. How does it feel? TR: Most of us spend our whole life building a business and then end up some day having to deal with it. I think people assume that it’s a selfish decision. The reality is it’s probably the most unselfish decision you make as an owner. You can’t take care of the people right as you get older, to really insure their place. All of these people who never changed jobs, who gave me the peak of their career – I owe it to them that there’s somebody with deep enough pockets so they don’t have to go sit in a lobby and fill out a job application. It was much less about us and so much more about the future of the company. It’s no fun selling your company. I don’t even care much about what’s in the bank. The reality is you just love this or you wouldn’t have done it for 30 years. NG: The Company that bought you, LDI – tell us who they are. TR: Liberty Diversified Industries. They’re a huge cardboard box company owning other operations, including importing office furniture. They have one of the most high-tech paper mills in Northern Minnesota. LG: I see. They understand capital equipment. TR: Yes. They have a deck company, a sheet metal company – a portfolio of companies. It’s a third generation company fortunate enough to have a lot of available cash and looking for a higher technology company. We weren’t on the market; they found us. I liked them because they were a local company. They had the financial whereabouts to build a company. They’re a family company, privately held, so it wasn’t a financial institution that came and bought us. I think I got the best I could find as a new partner, and I’m welcome to stay as long as I have a passion to do what I’m doing. I’d like to stay at least another year. TR: You never know. I could do this longer. Entrepreneurs don’t do well working for other people. But I would never abandon it until I’m comfortable leaving. But I also don’t want to be dying at my desk worrying about machine tools. In the spirit of most of us, we enjoy going out and starting something else. It’s in our blood. We love developing things. When we can’t do it anymore or we become a bystander in it, it’s much more difficult. Am I enjoying this? To some extent it’s nice. The risk is gone. The financial whereabouts is there for the employees, the growth, the benefits. But the reality of aging and time and taxes, we have to be honest about it all. But they treat me very well and I would like to contribute as long as I can. NG: Do you ever clash with them? TR: No, I honestly haven’t. I don’t always agree with them. I think it’s easy to understand if you’ve run your company your way. We never worried a lot about making the last dollar. They don’t either. But one of the things I always learned about bigger companies is they get so wound up in certain matters. If you’ve got a lot of guys traveling, they have a lot to do with their budgets, their meals, what motel they go to, what plane to catch and the difference is they can spend thousands of dollars on a simple one- or two-week outing. Corporate companies tend to look at expense reports. What’s this $3 here? If people care about their company, they’re going to try to do the right things. If they’re not doing that, get rid of them. If you have a team like that, you don’t have to even look at an expense report. You know it’s fair and honest. TR: Now mind you this guy got up 5:00 in the morning, probably caught the cheap fight, stayed in a Holiday Inn. Next trip the guy goes out and does his week, turns in his expense account, every receipt…The raincoat’s in there, but you won’t find the f*#*ing thing. The reality is you can distort anything anyway. What you really want is honesty, people who care about a common cause, their company and their job. I find small companies do a much better job of this than large companies. That part I have to get used to. You really want a team effort. So if you’re going to do something like that, have an incentive system. Do it out of a pot, distribute it to everybody that can benefit. To me, that tribal nature is far more productive than getting individuals hooked somewhere where you think they’re going to have some special thing they’re going to do for you. It doesn’t work in the community of a business. So I think it’s just a different style. LDI was probably the best I could hope for though. But still, I’m not really a corporate guy. I’ll never be one. LG: Tell me about the unique aspects of running a machine tool builder. LG: I need a part. I have to have the part. What are you going to do for me? TR: Yes, exactly. I think they forget all the money the machines made and the things it’s done right. So we’ve seen a growing number of people who are a little bit unfair. There’s a lot of anxiety in the market because they’ve been squeezed so hard on profits at the job shop level, maybe 10 or 20 percent call here that just aren’t reasonable and fair. We deal with that fen, but there’s a much nicer way to conduct business. I had a guy call a few months ago and said, “Tim, I’m so pissed off. I have called every day for two weeks and nobody’s called me back, nobody’s taking care of me. I want something done about this part.” We have a database under every machine sold, every serial number; log every call, every action, and every part. I said, “Give me a minute to study this. Not that we’re perfect, but this doesn’t sound like us.” I go to the database; I find not one single call. 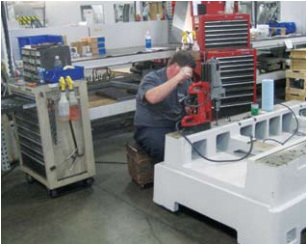 This guy’s never called in; he’s never had to get a part – his machines have been incredibly reliable for some time. So I call him back and I say, “You’ve got to help me here because I want to get to the bottom of who’s not responding to you, but I can’t find where you called.” Well, then the guy got irate, accused me of calling him a liar. But after a little time went by, an apology came forward. The reality is he never called in. He was just so used to getting a reaction by doing that. LG: How many machines do you sell a month? 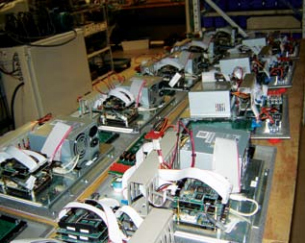 TR: Last month, I shipped out 60 machines. Some months are 40, some are 60. The goal in three years is 100 machines. LG: You’re competing with a Mazak that is having a huge extravaganza down in Florence, Ky., right now, and they’ll have a thousand people there. You have a Mori that is heavily involved in training, and Okuma that just developed THINC with 25 different partners down on a campus in Charlotte. Haas says they’re selling 12,000 machines a year. Then you’ve got Hurco with a huge export business. You’ve got Doosan building tech centers; they just put one down in Memphis. So you have a lot of heavy duty competition. How do you see the competition and how do you see yourselves competing with it? TR: It’s amazing isn’t it? Well I suppose I should be jealous of it. I’ve never visited some of those facilities because I’d be more demoralized. But I think it speaks to the fact they must operate with a bigger than 35 percent margin because you don’t do that stuff on our budget. NG: That’s what your margin is, 35 percent? TR: That covers this whole operation. LG: So you’re saying you work on a gross margin of 35? TR: Right and those people must work on a much higher margin. But our agenda has been a simple one. We want to take the small guy and make him better and affordable. I can’t compete with the big guys. I don’t want to be their enemy. I admire these people. I admire Gene Haas, what he did with his company; I admire Mazak, so I’m hoping they look at us as sort of this little guy who doesn’t mean much and so let’s just sort of leave them alone. LG: Right, but now you want to export more so you’re going to compete with them on export. TR: Yes. One of the nice things LDI can bring to the plate is financing in some of these countries. I could never do that. They’re able to finance, for example, in South America. We just extended all our warranties to two years on our products. That’s Japanese quality. LG: Tell us a little about doing business in a country like Columbia? We think Columbia is all drug money. TR: No, the differences in Columbia have been substantial. We see that country as a nicer business climate. We see those sorts of problems diminishing. They also like Americans. We don’t get too close to a lot of their customers, but a lot of them are very small, really mom and pop kind of shops. That’s our sweet spot. Until recently, maybe two years ago or three years ago, our average customer was a $3 or 4 million shop. LG: How do you get distribution in Columbia? TR: We cheated a little bit. I looked at Daewoo’s distribution. We’re a good ally with Daewoo. Most of our projects don’t overlap and so we’re a nice ft. I think we help them as much as they help us. LG: Since it became visible to everybody that Gene Haas was in all this legal difficulty stemming from his IRS problems, has there been any effect that you can see competing with Haas on an everyday basis? TR: I think it will have an effect. I think it’s sad that he did this. I don’t know why he did. I settled the same law-suit he fought. I suspect he’s got a drafting table in his cell and large screen TV. In fact, he may get more engineering done now than he was able to get done. But we aren’t going to build our business on the failings of others. But in terms of the impression left in the market, I think there’s more concern than meets the eye. I think his distributors worry, and it’s not so much that Gene isn’t there running the ship. I think it could be a moral issue. I would expect my employees to not feel too great working for me if I’m in jail. How do you get excited? Isn’t he part of the fuel of his operation even if he’s not there every day? After all, he does own it. I’m surprised how many people don’t know about it. Gene’s put a very good face on this. I think the magazines haven’t re-ported it fairly. It’s big news. Do you find it in any of the magazines? Yours will cover it, but the reality is look in the other popular publications. Nothing there on Haas. LG: Compared to a Mori or a Mazak, where is your pricing? TR: Half for a 20 x 40. Yeah, a lot less. They are a higher precision machine, no doubt. They are, in certain environments, going to hold up better. I mean you must get something for twice the cost. But the differences are very subtle and often we use exactly the same components. LG: During our tour, I realized you’ve always been overreaching. TR: That’s really interesting to say because my take on Milltronics is we were kind of naïve. We didn’t know that there were boundaries we weren’t supposed to cross. We did what nobody thought anybody could reasonably do. Who would’ve ever thought a little company and a few guys could make one of the best controls in the world? 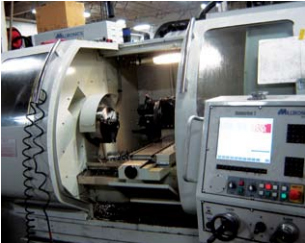 Who ever thought you could with a limited capital, small family business with no money end up producing $40 million of machining centers that changed the world? I do believe a lot of our products do change the world. We didn’t know better. That was the beauty of this company. We just thought, “Why can’t you do that?” I think it’s sort of the ultimate entrepreneurship in this country. We were recognized for it locally. I was Entrepreneur of the Year for the upper Midwest, a nice prestigious award. So people locally did recognize we were able to do unusual things. But what they actually gave that award for was how much we shared with the employees. They thought that was so unique, and the bank at that time nominated our company as a unique company because you didn’t see our kind of bonus system years ago. We did it, and have no regrets of giving out a lot of bonus money. I think it’s a nice saga to leave because after we’re gone, what are they going to remember about you and me, really? Just that they made a lot of money? 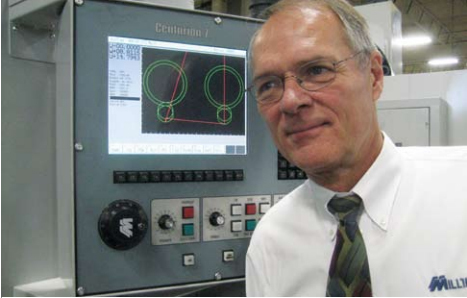 NG: Tim’s son Benjamin is the Director of Operations at Milltronics. Ben, when did you start working in the company? BR: That was 16 years ago and it was basically as soon as I was able to drive. I went from one department to another and did that pretty much all high school, and then through college, my summers, and then in college I could place my schedule so I could have a few days off and then come work. It felt like a 10-year internship while I was at school. Then once I graduated, I started full-time at learning every department and how they all connect. LG: Were you fully onboard with the decision to sell the business? BR: I totally supported it. We were limited to what we were able to do anymore just because we were strapped for capital and there’s so much more we could do, if we had the resources to do it. This is a big market. There is a lot of opportunity for us out there. But there’s risk. I’ve lived my whole life seeing the work my parents put into the business. LG: Your dad said he knew that the bad day would come. BR: Yeah, not if, but when. I had to look at it a little bit unselfishly. The sale was great for them, and selfishly, how’s it going to impact me? It couldn’t have been a better choice in the company that we sold to because LDI is very family-based and family oriented and committed to retaining that presence and that image. The deal was completed six months ago. I’m definitely committed to it. I have an open contract. As long as I want to work for them, I can.